We are back home from our trip to the coast of Southern Italy, and I have compiled a list of over 40 dishes that we tried during our trip and that I would like to recreate at home. This first one we had at Taverna Il Cantinone in Vieste, a good trattoria with delicious local dishes. 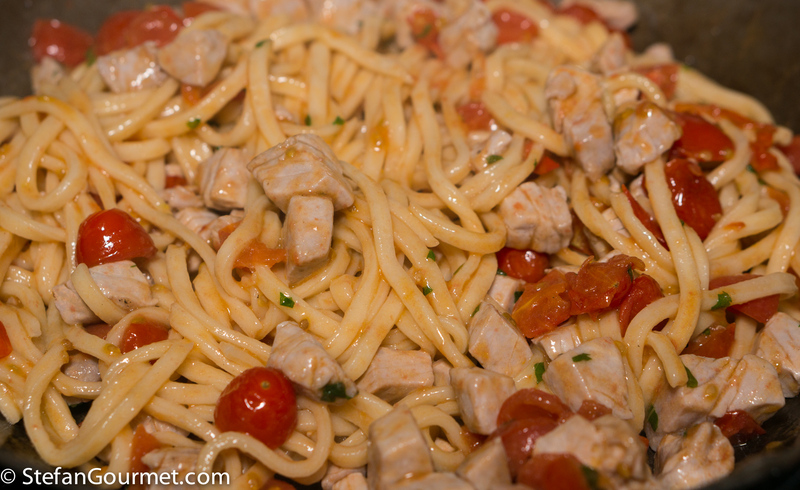 Here fresh pasta is served with barely cooked fresh tuna (locally caught bluefin tuna), tomato, and just a touch of mint. The key to success is to work quickly, as the tuna will overcook very easily and the troccoli need to be served al dente. The mint does a great job of brightening up the dish, but only a little should be used to avoid overpowering the other ingredients. At Il Cantinone this was made with chopped tomatoes, but as the tomatoes I can get here are not as good I decided to use cherry tomatoes instead. Vieste is on the peninsula of Gargano, which is the ‘spur’ if you think of Italy as a boot. This is in the region of Puglia and the province of Foggia. The local pasta shape is called troccoli, a thick and square type of fresh spaghetti. The dough for troccoli is made using only semolina flour and water (and perhaps a bit of olive oil or salt), no eggs and no 00 flour like in the North. 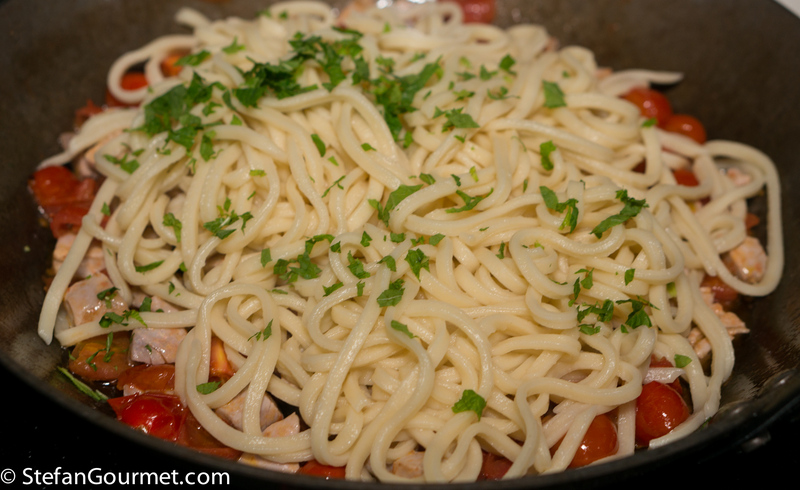 It is very similar to spaghetti alla chitarra, from the region of Abruzzo. In both cases the dough is rolled out to a thickness of 3 to 5 millimeters (1/8 to 1/6 inch). The difference is that troccoli are cut into noodles with a widt of 3 to 5 millimeters (1/8 to 1/6 inch) using a grooved rolling pin with grooves called a troccolaturo, whereas for spaghetti alla chitarra the dough is put on an instrument with strings (it looks more like a harp than a guitar) and then pushed through using a regular rolling pin. 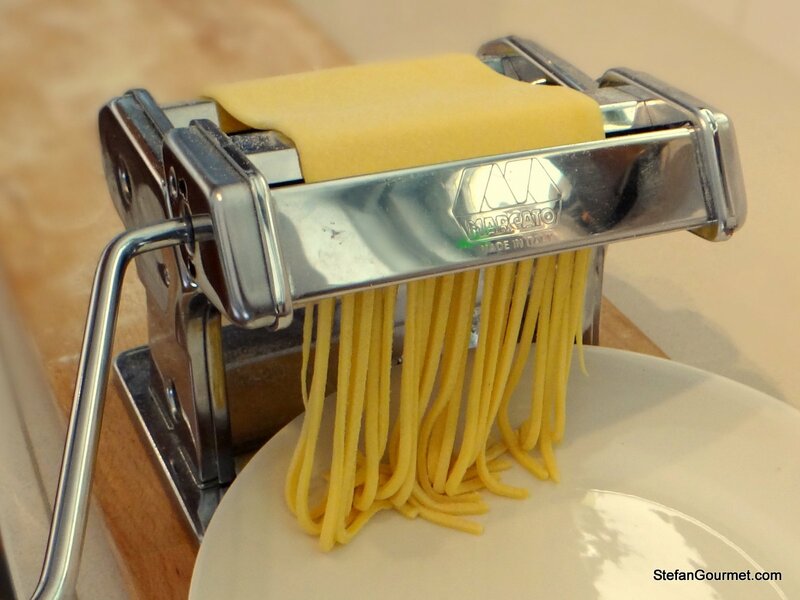 I own neither a chitarra or a troccolaturo, and use the fettuccine-cutter of my pasta machine to obtain the same result. I doubt whether you would be able to tell the difference. 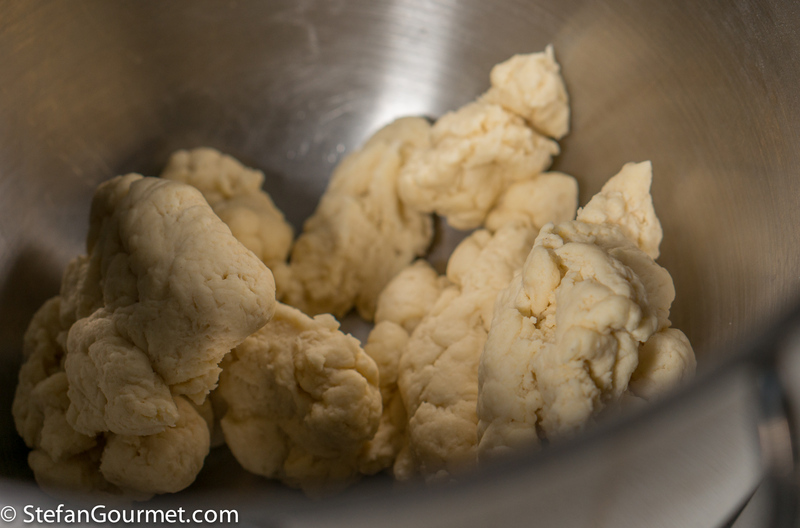 First make the dough for the pasta. It is important to use as little water as possible, just enough to let the dough get together. 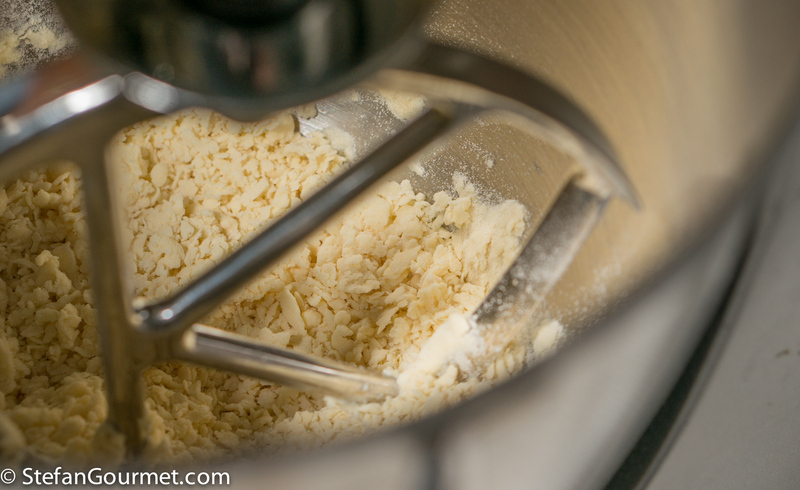 Start with 200 grams of flour and 100 grams water, and combine it in the bowl of the stand mixer. Add 1/8 tsp of salt. Mix with the paddle attachment on medium speed until you get coarse particles that won’t clump together any more. …until the dough just comes together. Some patience is important here. 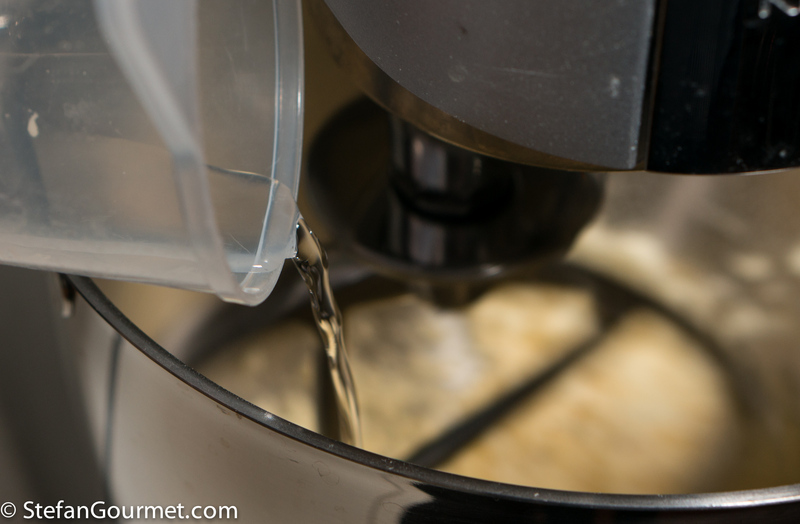 If you add too much water at once, the dough will get too sticky. 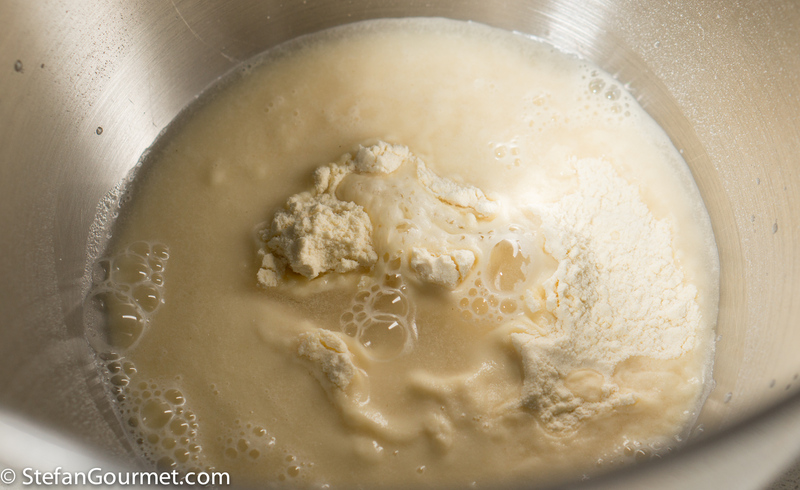 The amount of water will depend on the humidity of the air and the flour, as well as how fine the flour was ground. So there is no standard amount of water and this is the best way to get it right. 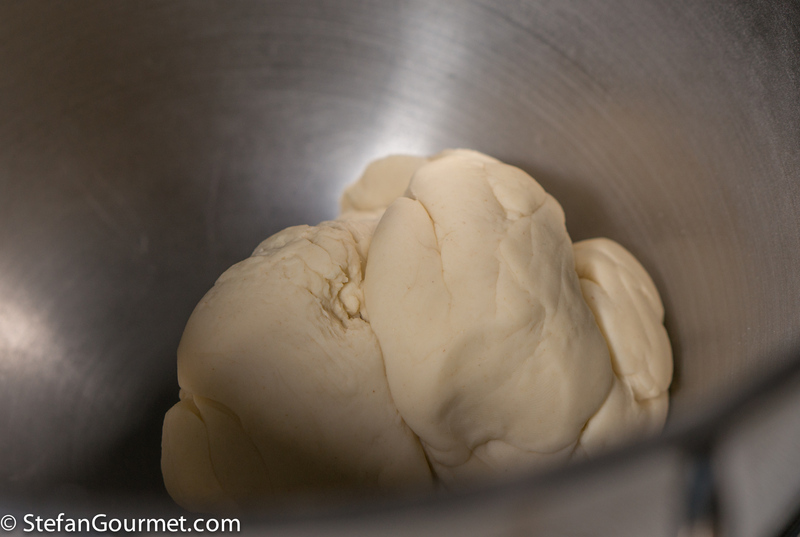 …until the dough is smooth and elastic, about 10 minutes. 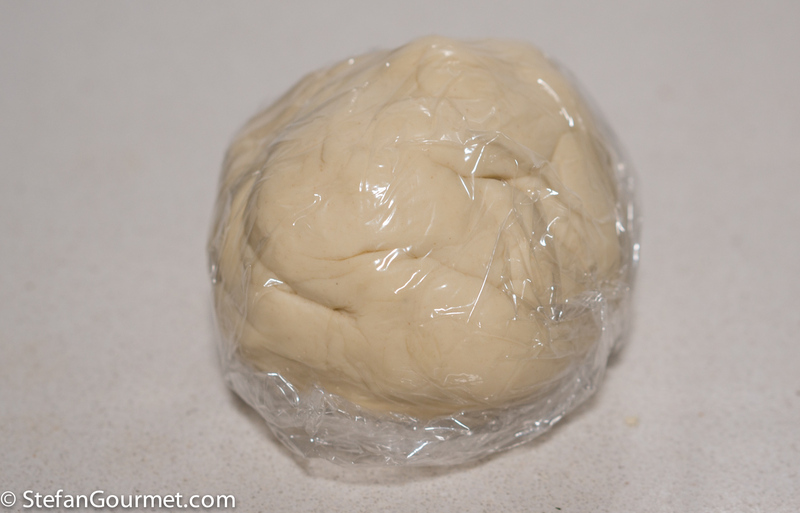 Wrap the dough in plastic and allow to rest for half an hour. There is no need to put it in the refrigerator as there is no raw egg in the dough. After the resting time, roll out the dough using a rolling pin or pasta machine to a thickness of about 3 mm (1/8 inch), and cut it into noodles using a troccolaturo, or a chitarra, or another pasta cutter that will cut it into the right thickness. 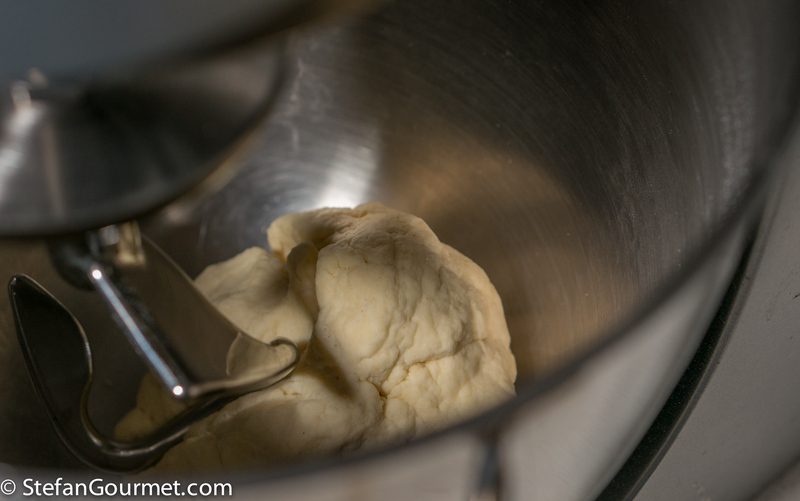 Click here for instructions on how to roll out fresh pasta dough using a pasta maker. Bring a large pot of water to a boil. 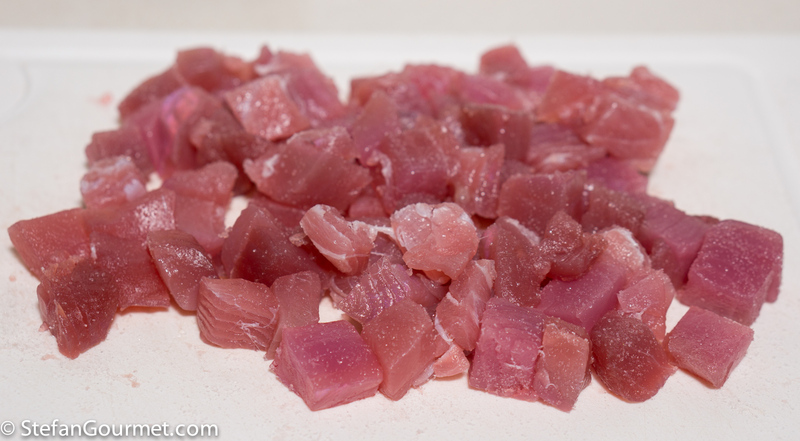 In the meantime, dice the tuna (about 1 cm or 1/2 inch dice) and season with salt. 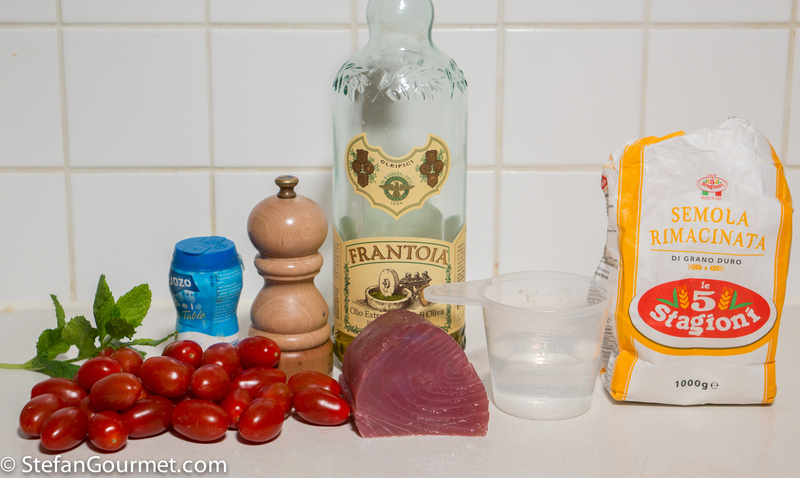 Cut the cherry tomatoes into halves or quarters, a similar size as the tuna. Mince the mint. Heat up a large frying pan. Make sure you have everything ready to work quickly to finish the dish. When the water boils, add the troccoli. Cook the troccoli until they are al dente. The time will depend on the thickness, but probably 2 or 3 minutes. 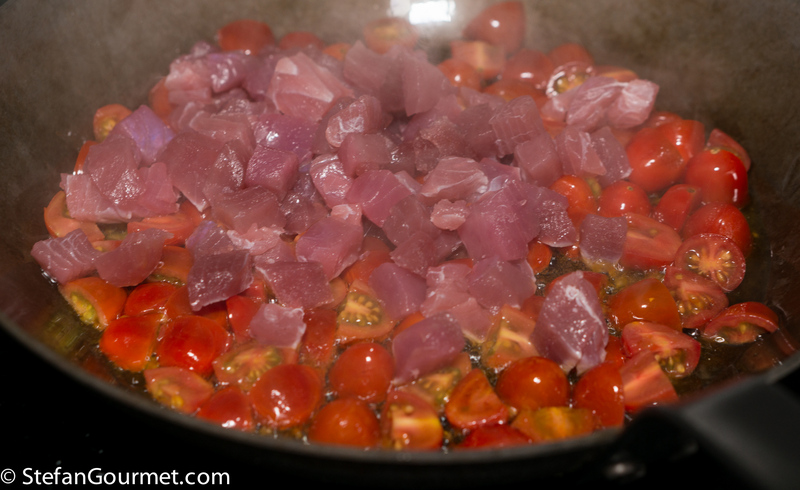 Immediately after putting the troccoli into the water, put 2 tablespoons of olive oil in the frying pan and the tomatoes. Season with salt. 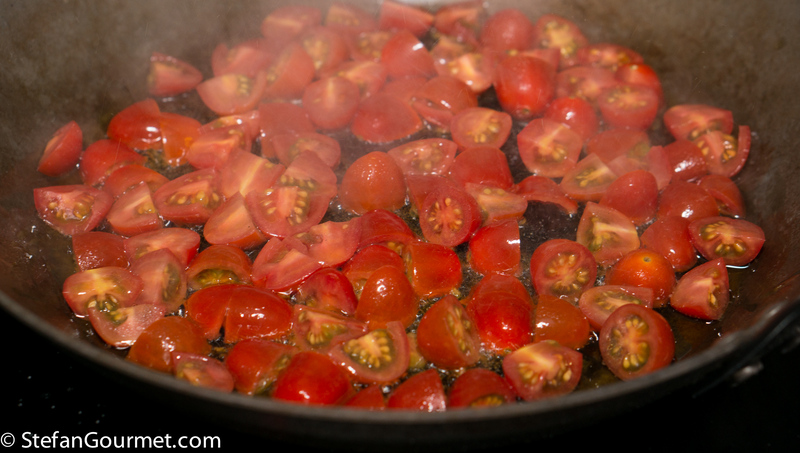 Stir over high heat until the tomatoes start losing their juices. …plus about half of the mint. 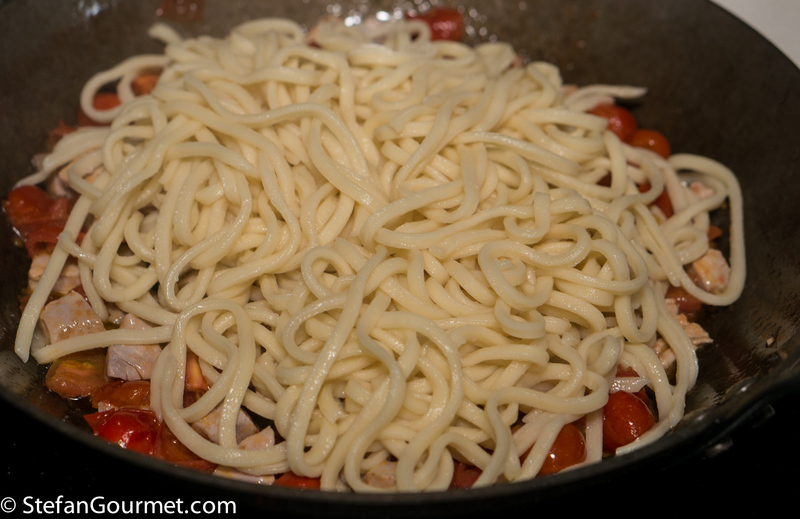 Toss quickly over medium heat until the pasta is covered with the sauce. Season to taste with salt and freshly ground black pepper. Serve at once on preheated plates, garnished with the remaining mint. If you like, you can sprinkle with very good extra virgin olive oil. 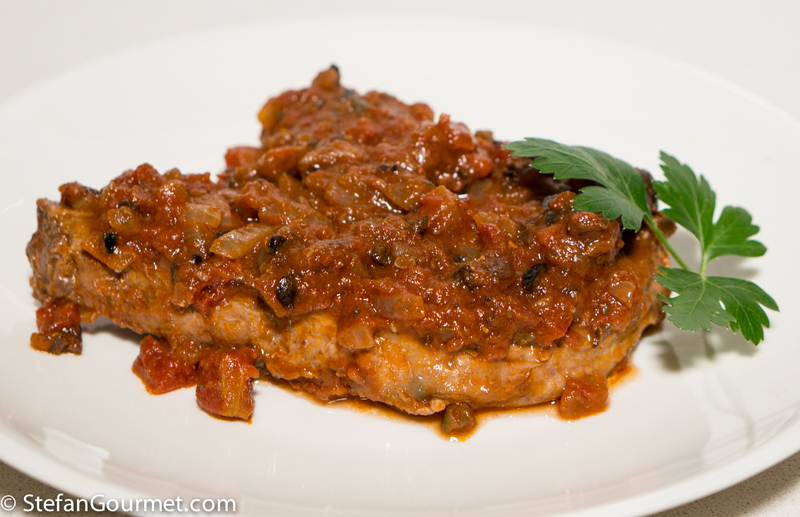 These pork chops are served with a piquant sauce that contains tomatoes, olives, capers, onions, and just a touch of cayenne pepper, and is loaded with flavor. This recipe is simple but very very tasty. The dish looks fantastic, really delicious. Good Job! Thanks for the inspiration. 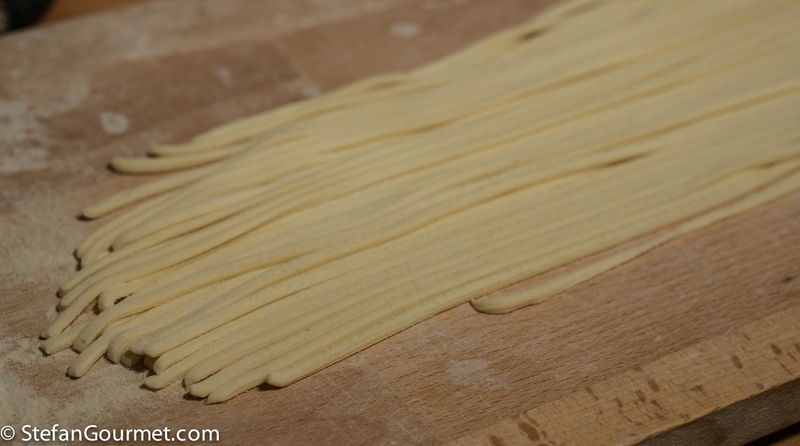 I make fresh pasta on a regular basis both with eggs or just with semolina flour and water. Would you really call the texture of properly cooked fresh pasta “al dente”? Usually, I let the pasta dry a little bit. However, since it dries from the outside to the inside, I find it very difficult to cook it al dente. On the other hand, I’ve never tried thick noodles like troccoli. Will give it a try very soon. It is certainly different from the al dente of dried pasta. To get it more like that, allow the pasta to dry for a longer time. But that of course will make it less like fresh pasta. 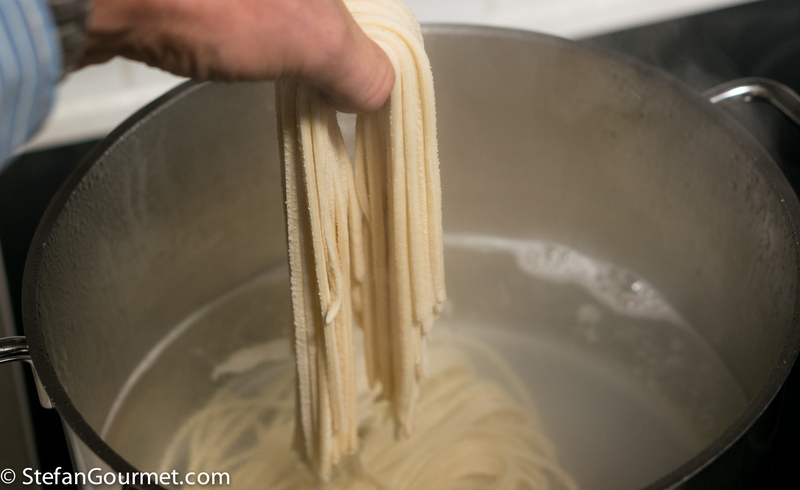 If cooked too short, fresh pasta will taste raw, unlike dried pasta, which will be gritty in the center. Quel tipo di tonno è pescato nell’Adriatico? Secondo Wikipedia il tonno pescato in Italia è il tonno pinna blu, anche chiamato tonno rosso. L’ho corretto, grazie. The dish looks fresh and vibrant, it must have brought you right back to the first time you tried it. Fresh pasta is incredible. I have not made it without eggs, will have to try it sometime soon. 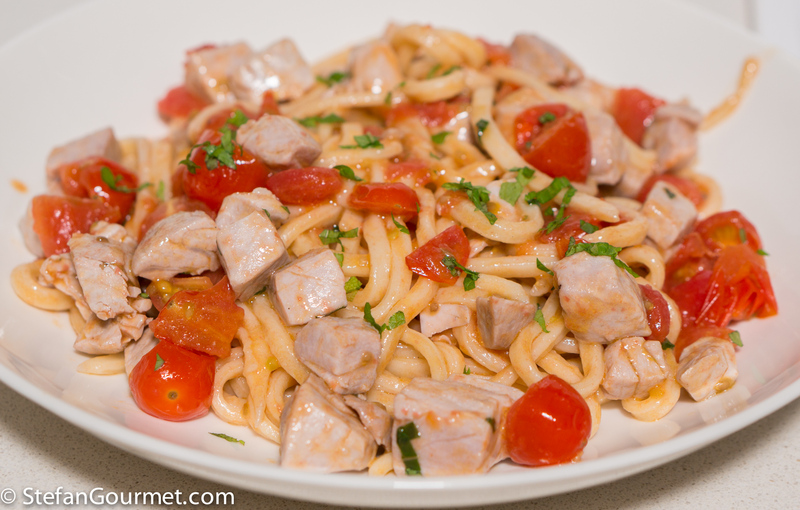 I have not normally cut up tuna so small – but it looks wonderfully appetizing . . . . now to try the pasta ! Hope you post some of the other recipes you have collected as well as Kees gets to eat them . . .